Midsize Diamond Turning Lathe. 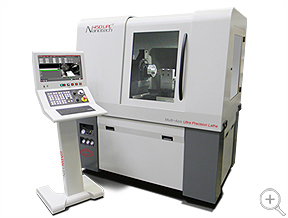 Only Nanotech offers a proven and established midsize ultra precision system. The 450UPLv2 is comfortably suitable for both single point diamond turning and deterministic micro-grinding of optical elements. Applications examples include the manufacture of components used in a wide variety of markets such as electro-optics, aerospace, defense, consumer electronics, bearing, and computer industries. As an ideal midsize option for our customers, the standard configuration of this popular machine model yields a 450mm diameter swing capacity, but increased swing capabilities are readily available upon request. Expansion of the basic 2-axis system is simple. One can have up to 4 axes of continuous path motion via the addition of C & B or C & Y. The C-axis motion control of the work spindle enables toric, biconic, and other freeform surfaces to be machined "on-axis" via our Slow Slide Servo (S3) process. Our Oil Hydrostatic Rotary B-axis or removable Vertical Linear Oil Hydrostatic Y-axis can be configured independently on the Z-axis carriage for future added flexibility. Featuring a high speed 64 bit Delta Tau PowerPMAC, this motion controller is the industry's first touch / swipe gesture "smart" screen display. Three customizable 22" wide screens are accessible by swiping left or right from the main screen. Now you have the option to easily create and save your own custom user friendly interface screens to satisfy a particular individual's preference or a specific application. 5GB program file sizes, 4X faster processing speeds, remote diagnostics and an industry leading 8 picometer feedback resolution combine to make the new Nanotech 450UPLv2 the most operator friendly high performance mid-size diamond turning system available. We welcome you to experience the difference for yourself! The system was developed with the latest "precision engineered" designs and components, including high stiffness oil hydrostatic bearing slide ways, and state-of-the-art linear motor drives with sinusoidal drive amplifiers. This ideal center mounted thrust plate design, engineered for both heavy loads and high throughput applications, now includes the added benefits of porous graphite. Motion accuracies are guaranteed to less than 12.5nm throughout its 10,000 rpm speed range with total liquid cooling for long term thermal stability.